Matt Roy scored his first NHL goal to start a third-period comeback, and Jonathan Quick made 23 saves as the host Los Angeles Kings beat the San Jose Sharks 4-2 Thursday night. 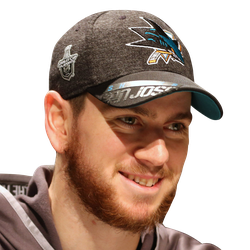 With his team down 2-1 nearing the midway point of the third period, Roy, a seventh-round draft choice in 2015, fired a slap shot from the point that somehow went through a maze of players and a screened netminder to tie the game. Roy was playing his 16th NHL game. Anze Kopitar's 21st goal of the season a couple of minute later became the game-winner. Kopitar gained the puck at the slot and completed a nifty deke to give the Kings a 3-2 edge with 8:15 left on the clock. Jeff Carter's empty-net goal with 1:17 remaining iced the game for the Kings, who sit last in the Western Conference. Los Angeles won when trailing after two periods for just the second time this season. The Sharks, who were without key forwards Joe Pavelski and Logan Couture plus defenseman Erik Karlsson, have lost four consecutive games. It was a see-saw game with Dustin Brown's 20th goal of the season staking the Kings five minutes into the tilt. Brown gained the puck deep in the zone, skated to the top of the left circle and then fired a short-side shot that found the net. It is the seventh time in his career that Brown has reached the 20-goal standard. 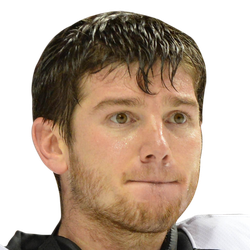 However, Barclay Goodrow pulled the Sharks even with 2:27 remaining in the opening frame. He was parked at front of the net and deflected Marc-Edouard Vlasic's point shot for his seventh goal of the season. Then Tomas Hertl put San Jose ahead by a 2-1 count 3:45 into the second period, netting his 32nd goal of the season by finishing off a give-and-go with Brent Burns, but the visitors couldn't hold the lead. Martin Jones stopped 31 shots for the Sharks, who sit five points behind the Calgary Flames for top spot in the Pacific Division, but five points ahead of the surging Vegas Golden Knights.